Photo of the 2018 President’s Award winners. Nominations are currently open for this year’s WSU Leadership and Engagement Awards of Distinction. The awards honor WSU student leaders, and those who have mentored and supported the efforts of these students as they work toward leadership and social change. 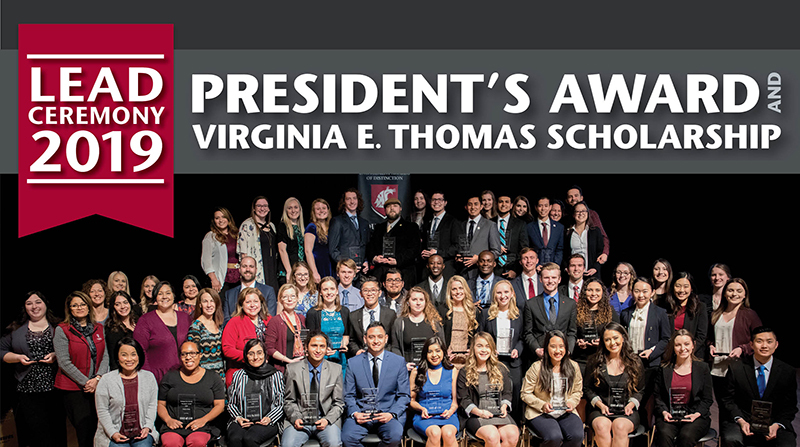 Student nominations are open until Monday, Feb. 18, while all others close on Friday, March 8. Nominations will be accepted from all WSU campuses and can be submitted at on the Leadership website. The President’s Awards honor those who advance leadership and engagement at WSU and beyond. Recipients of this award demonstrate exceptional leadership and service to students, WSU and our community. Nominations are accepted in these categories: student, student organizations, faculty and staff, and community organizations. Honorees will be recognized during the LEAD Ceremony on Tuesday, April 16, on the Pullman campus. Thomas served as director of the Leadership Center at WSU from 1995 to 2003. As an advisor to the Associated Students’ officers and other organizations, she promoted excellence, modeled integrity, and encouraged discovery and innovation.